Read by Arthur Morey – 36h. 43m. I chose to read this because of a recommendation from Bill Gates on his web-site, The Gates Notes, and also because I read his Pinker’s prior work, The Blank Slate several years ago. The main thrust of The Better Angels of Our Natures is that the world has become less violent, less cruel and more peaceful in the last few centuries. 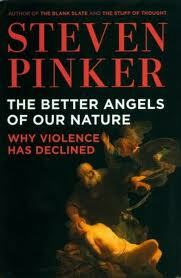 Pinker follows that with a LOT of statistics showing that violence has steeply declined in the last several hundred years. Reviewing them I barely recognize our world – yes, I become very aware that there is significantly less violence in our world today than the world I was born into, to say nothing of the world of my parents, grandparents and prior. We just don’t see the forest for the trees – the things which are protested today – animal cruelty, child safety, harassment of gays and racial slurring – would have been too commonplace to note a couple hundred years ago in the midst of lynchings and child labor. Then Pinker goes into chapter after chapter of possible reason for this phenomenon. I think it got to be a bit too much info when he was getting into psychological experiments but it was all interesting. It opened my eyes to a broader reality. But he goes too far when he suggests that we in our age are more “intelligent” than our predecessors – 1. they weren’t working with the same environment – 2. I know folks who think the very way Pinker declaims – the entire political far right political is guilty. The intellectuals and liberals may have made headway in the last 40 years but the ultra-conservatives are pushing hard to be heard again – and there is no allowance for evolution or Islam – gun control is off limits and capital punishment is sacred. We have Pinker thinking that his values are the most “intelligent.” This kind of thinking makes me wonder about the other areas – and if Pinker isn’t “cherry picking” – using data which agrees with his pre-set conclusions. To my surprise, this is the same area which Peter Singer finds suspect in his review of the book, Is Violence History? I think if we removed the coercion of the government we’d be just as bad as we were generations ago. Now I happen to agree with most of what Pinkier holds up as being the “more intelligent” solutions to issues, but I’m sure there are plenty of incredibly intelligent conservatives who hold opposing views. This leads me to think that perhaps he cherry-picked a lot of the statistics and that the chapter on psychological testing was an attempt to bolster a failing argument. I don’t know. I tried to excuse some of what he said on the basis that the subtitle is “Why Violence Has Declined” and not “How people are really better these days.” because I don’t see better in the greed in the stock market, continuing plunder for oil, desire to cut human benefits from the fiscal budget. I don’t think conservatives would regard abortions as being less violent – Pinker regards women to own their own bodies as a positive. Anyway, it is a good book in spite of all that – very interesting even when Pinker digresses into marginally related material. And it gets me out of the automatic “the world is going to hell” thinking to take a broader look. But it’s not going to have me turning Pollyanna. Reason is a tool. The value of reason equals the value of what is done with it and that depends on goals. Hitler and slave owners used reason.